Those who have themselves experienced the adverse effects of cocaine or who have watched a loved one experience the adverse effects of cocaine have no doubt that cocaine is a destructive drug substance. However, many individuals are able to successfully hide their cocaine addiction problems for some time, even from their close family members and friends, leading some to wonder whether cocaine is truly as addictive as advertised. Cocaine is a stimulant drug substance derived from the leaves of the South American coca plant. Like all other drug substances, cocaine is a chemical that interferes with the normal functions of the human body. And like all other drug substances, cocaine can become tolerated by the body, driving the individual to consume larger quantities in shorter periods of time in order to stimulate the desired effects. It is at this point that the individual is most at-risk for developing a cocaine addiction. Cocaine creates its effects in the body by raising the level of dopamine produced in the brain and by preventing it from being recycled back into the cells that released it. Dopamine is a neurotransmitter involved in the processes of pleasure and reward, and the flood of dopamine caused by cocaine use can actually interrupt the body’s ability to produce this chemical naturally. What this means for the individual is that he will eventually depend upon cocaine in order to experience any sort of pleasure. 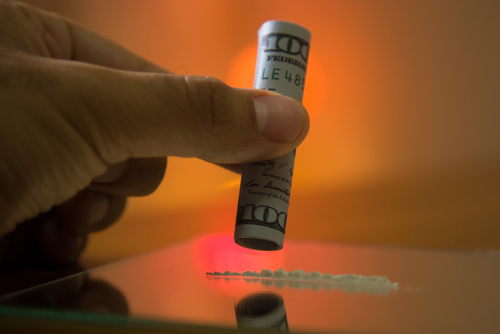 Unfortunately, since their body has become tolerant of cocaine, the individual finds that not only does he need cocaine to experience pleasure, he needs increasingly larger amounts of cocaine, and he may never experience the same sort of pleasurable high as he did the first time he took cocaine. Eventually, the individual can become entirely dependent upon and addicted to cocaine, compulsively continuing to use this drug substance despite all adverse effects and coming to the belief that they cannot actually function normally without the continued, regular use of this drug substance. In determining the addictiveness of cocaine one has to consider the fact that cocaine gives the individual a very quick high, and also a very fast comedown. Obviously, this means that an individual will want another hit, and fast. However, it is also true that some individuals are irritated by the addictiveness of cocaine and the rapid letdown and ensuing discomfort, and so choose to stop using this drug substance. Such individuals may argue that it’s not quite as addictive as advertised, because they were able to end their relationship with cocaine when they were no longer interested in experiencing minimal rewards and maximum discomfort. That said, not everyone who has encountered the addictive properties of cocaine have been able to end their use of this drug substance, and they have subsequently fallen into the trap of cocaine addiction. Therefore it is far better to be safe than sorry, and simply abstain from the use of this drug.